One of the best characteristics about dividends is they usually offer a consistent, preferably growing stream of income. However, investors can easily fall into the trap of becoming complacent that future payments will continue to flow in, even when the business isn’t generating enough cash to fund the dividend. The higher the yield being offered generally means the riskier the dividend is and sometimes losses can outweigh the expected income. For example, Dynagas LNG Partners (DLNG) cut its 16% yield back in April and shares are down 16% since. It’s very tempting to reach for higher yielding stocks, especially when the 10-year government bond is at a seven-year high and north of 3.2%. However, dividends of 10% and higher need to be scrutinized closely and I’ve identified two more that are in danger of disappearing. Hi-Crush Partners (HCLP) is a master limited partnership (MLP) that produces fracking sand. 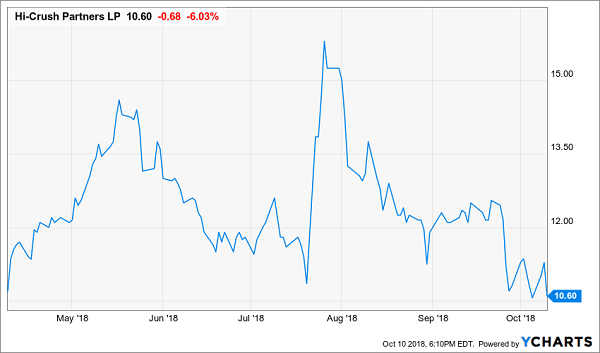 The past couple of months have been a roller coaster for the company; management increased the quarterly distribution by 433% in July, but the stock has lost 20% since, wiping out the benefit of the now 28% yield! If it’s possible for the story to sound crazier, Hi-Crush only resumed paying a dividend four quarters ago, following a two-year hiatus. The new distribution of $0.75 a share is part of a strategy by management to convert the business from an MLP to a regular C-Corp by the first half of 2019. The payout will likely decline once this occurs, but the bottom has also since fallen out of the fracking sand market. As a result of lower customer demand and prices, the company idled part of its Whitehall facility in Wisconsin last month. If dividends are about generating consistent income for your portfolio and sleeping well at night, then Hi-Crush likely isn’t the best option. The yield is artificially high and investors have been crushed by the underlying stock. Oxford Square Capital (OXSQ) is a business development company (BDC) that invests primarily in collateralized loan obligations. The company changed its name earlier this year from TICC Capital, but shareholders may be forced to repeat mistakes that were made in the past. Management already cut the dividend once in 2017 and another reduction could be in the cards for Oxford Square. 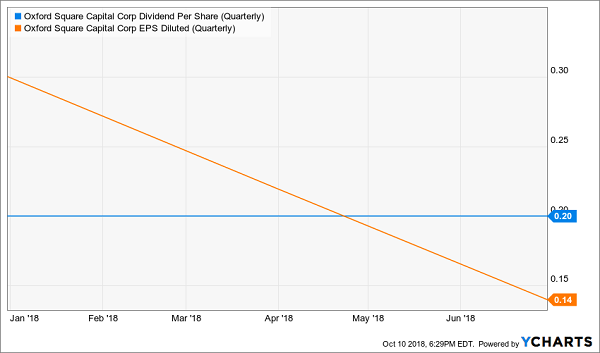 Revenue declined by more than 20% in the first half of the year and the company’s earnings fell short of the quarterly dividend of $0.20 a share (11.5% yield) in both the first and second quarter of 2018. No matter, what name it’s operating under, any company will struggle to pay out more than it’s earning for more than a few quarters. Oxford may be trading at an 8% discount to its net asset value, but that might not be enough to cushion the blow of a potential dividend cut. Chasing double-digit yields is risky business. The investing graveyard is littered with dividend promises left unfulfilled when the cash was no longer flowing in to sustain these lofty payouts. A stock like Dynagas or these two potential time bombs can spell disaster for your portfolio, especially when in or nearing retirement. Not only might you have to forego some much-needed dividend income, but you could also potentially lose your hard-earned nest egg when the Dow Jones Industrial Average can fall 800 points in one day. 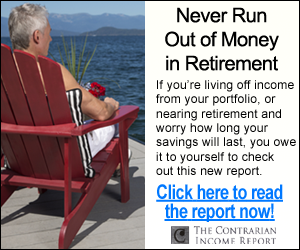 Whether you’re already retired, or looking to augment your paycheck with the passive income that dividends afford, you no longer have to choose between measly 2% to 3% yields from dividend “aristocrats”, government-secured interest payments that barely keep up with inflation and dicey double-digit dividends. 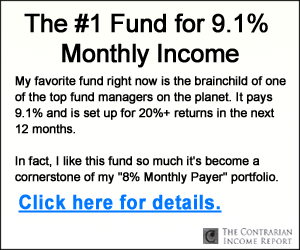 Closed-End Funds (CEFs)- We’ll share our top three CEF picks with you, each of which pay a monthly dividend. Many of these trade at a discount to net asset value; but unlike Oxford Square, actually can afford to pay their dividends. Recession-Proof REITs- discover two REITs that actually benefit from higher interest rates; rather than being crippled by the Fed.